I was on Security detail at my church again. They keep the temperature cool, so I was wearing a jacket. 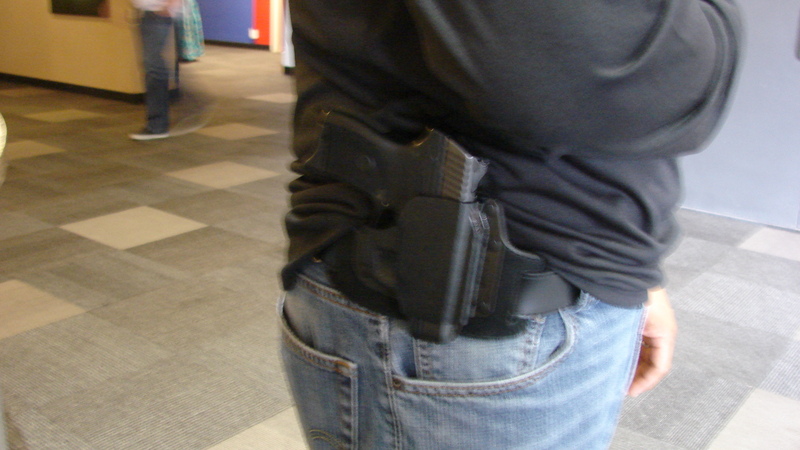 One of the difficulties of open carry is that it becomes awkward when you are wearing clothes to keep warm. So I was carrying casually concealed. I did not mind the temperature. I am acclimated to warmer temps; but it is easier to for me to put on a jacket than it is for someone who likes it a bit cooler to remove their skin. 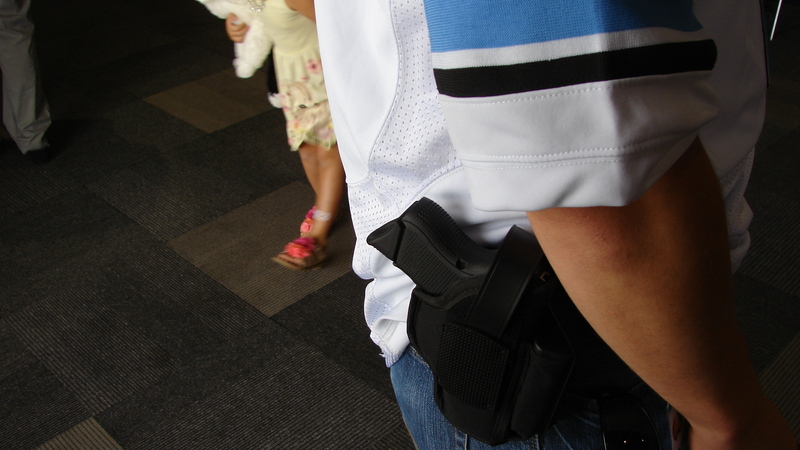 I noticed five open carriers, and at least one other concealed carrier. I only noticed that he was carrying concealed because he adjusted his shirt and I caught a glimpse of an in the waist band holster in the appendix position. There were certainly a number of other concealed carriers. By definition, they are harder to spot. I may well have missed a couple of open carriers as well; I was not on a "roaming" position that Sunday. Maybe a Bersa? Note the folding knife, clipped to the pocket. I was reading David Hardy's excellent new book, "Origins and Development of the Second Amendment, when I found a reference to colonial requirements to carry guns in church from the Virginia laws of arms bearing. The law dated to 1631. David Hardy found it in the 1823 work by William Henning, "The Statutes at large, being a collection of all the laws of Virginia, Vol. 1 at 127, 173-174." Those were perilous time in Virginia. This congregant preferred a Ruger LCP. All of the open carriers that I noticed were younger than I am. One of the things that I enjoy about the Vertical church is the significant number of young people and families with children. 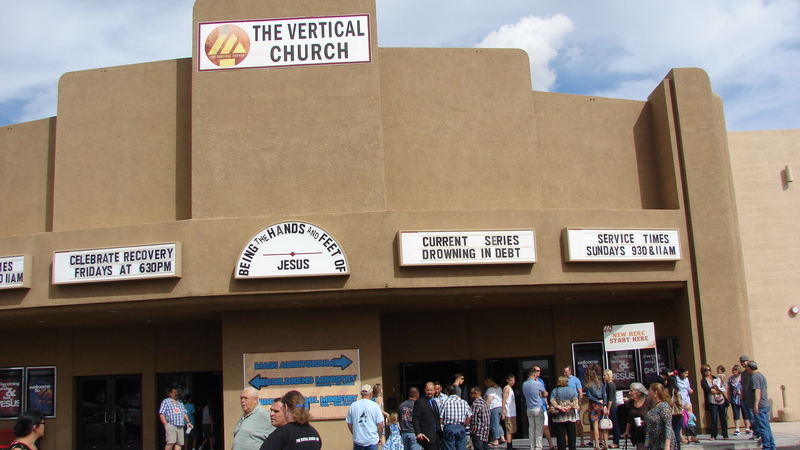 It is a thriving and growing church. All firearms in Brazil are required to be registered within the state. The minimum age for ownership is 25, and it is generally illegal to carry a gun outside a residence. 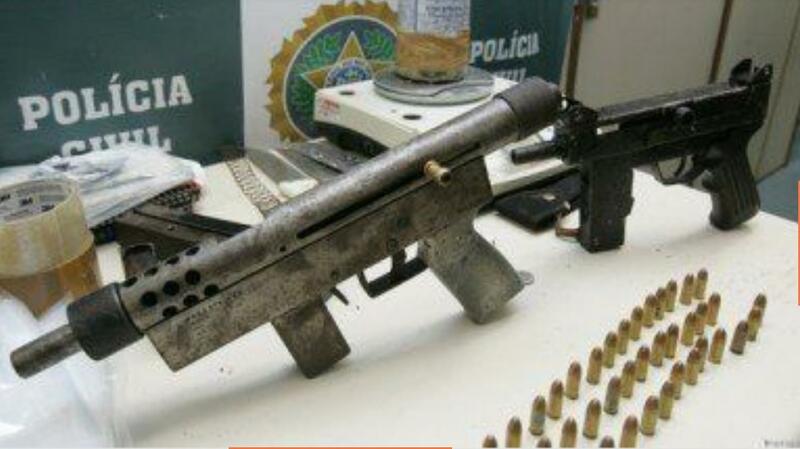 Brazil only has 6-8 million legal guns, and they are heavily restricted. Brazil's population is over 200 million. The Homicide rate is 25.2 per 100,000, six times as high as that in the United States. Another study puts it at 32.4 per 100,000. With more than 92 percent of the votes counted, 64 percent of Brazilians were opposed to the ban, while 36 percent backed it, said election officials, giving the ’no’ position an insurmountable lead. The proposal would have prohibited the sale of firearms and ammunition except for police, the military, some security guards, gun collectors and sports shooters. It would complement a 2003 disarmament law that sharply restricts who can legally purchase firearms and carry guns in the street. 10 years after the referendum, and 12 years after the passing of the draconian gun law, the murder rate has remained essentially flat, with some small up and down variations. The reform was part of the agenda of the centrist PMDB party. "Our proposal is to guarantee the good citizen's right to self-defense," said the law's author Laudivio Carvalho, from the powerful centrist PMDB party. The Brazilian retreat from citizen disarmament may be part of a larger movement. The Panamanian government is also considering reducing restrictions on citizen ownership and carrying of arms, in order to reduce crime. Police say the incident began at a nearby home when Bruner, who was armed with a sawed-off shotgun, banged on the victim's door. The victim answered the door with his gun and a fight between the two ensued, according to police. The fight dragged into the middle of the street where the two men exchanged gunfire. Both were killed, according to police. After a Terpsichore Street resident shot an alleged burglar attempting a mid-day break-in of his shed on Tuesday, New Orleans police say the injured man is recovering and the homeowner is not being charged, authorities said. ROBESON COUNTY, NC (WMBF) – A shooting is being ruled self-defense after a 38-year-old man was found dead in a driveway on Fire Tower Road in Orrum, North Carolina Wednesday evening, according to Robeson County Sheriff Kenneth Sealy. Police said around 2 a.m. Thursday, the woman's ex-boyfriend showed up outside her home on Jamestown Way and would not leave. Police said the woman shot through the front door hitting the man in his back. If FBI moves to 9mm, what happens to the .40 cal Pistols? 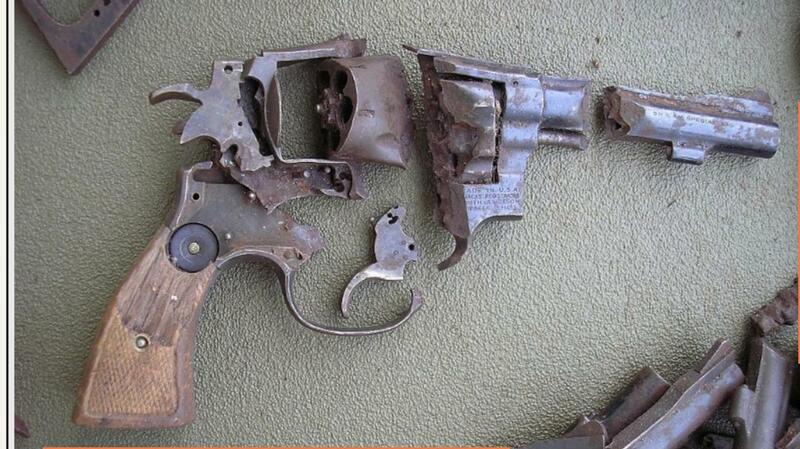 The Smith & Wesson revolver was paid for by U.S. taxpayers. It was a finely crafted piece of machinery that served its country of origin well. It is legal to own in all 50 states, by nearly all citizens. But the Clinton administration chose to pay additional tax dollars to reduce it to this sad pile of scrap. The destruction likely occurred at Anniston Army Depot. The Federal Bureau of Investigation (FBI) is issuing an unrestricted solicitation for various 9mm luger pistols and all associated replacement parts with the intent of making single award of a fixed price indefinite-delivery indefinite-quantity (IDIQ) contract. In accordance with FAR 2.101, Multi-Agency Contracts, this solicitation includes a provision authorizing other law enforcement agencies to utilize the contract on a case-by-case basis with prior approval. The anticipated period of performance consists of one (1) base year and nine (9) possible additional one-year options. It is worth noting that the offers are to be received in late January of 2016, so that receipt of the pistols will be either after, or at the very tail end of the Obama administration. The question is: What will the FBI and other federal agencies do with their extra .40 caliber pistols? Most police agencies trade in their surplus pistols or sell them to dealer. They then enter the usual channels of commerce and are sold just like new pistols, except they are known as law enforcement trade ins. Some police departments have insisted on destroying these valuable assets as a politcial statement. Eleven states have passed legislation to stop this wasteful practice. In August 1993, a powerful machine nicknamed "Captain Crunch" was put into operation to grind up these hundreds of thousands of small arms. Defense Logistics Agency spokesman Larry Wilson said that the weapons are put on a conveyor belt that goes up perhaps 15 feet then the weapons drop into the metal canister. The metal canister ("Captain Crunch") has some "serious" teeth in it, and the "gun barrel goes in, and little pieces of metal come out," said Wilson. Simple, but effective, and no re-welds! The demil process kicked into high gear after the August 1993 start-up. In a March 1994 interview, spokesman Larry Wilson said that "Captain Crunch" had ground up 307,000 firearms at a cost of a little more than $1,000,000. Wilson gave a break-down of the guns destroyed as of March 1994 as follows: .45 caliber automatic pistols (110,000), M-14 rifles (50,000), M1 carbines (45,000), M1903A3 drill rifles (40,000), M1 Garands (30,000), M3 .45 "grease guns" (20,000), M1903 Springfields (6,000), and M12 .22 caliber target rifles (6,000). Wilson calculated it had cost $3.52 to destroy each weapon and the Material Command was destroying 3,000 guns per day. 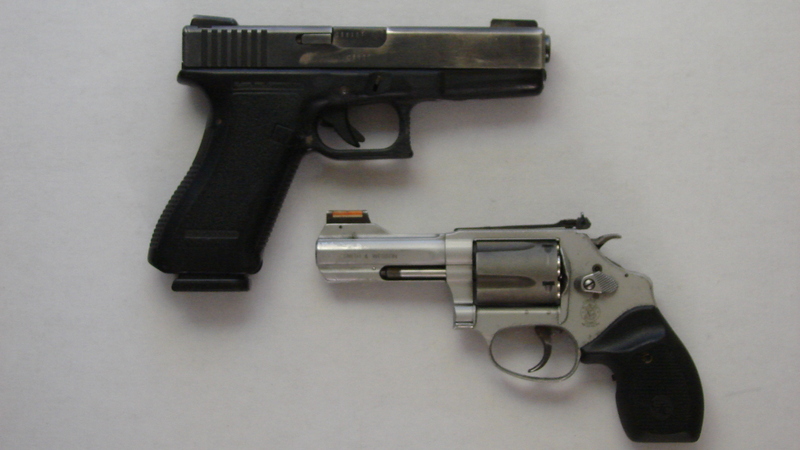 What will happen to the surplus .40 caliber pistols of the FBI and other federal agencies? Some may be offered to police departments as surplus. The tendency of elite administrations since 1970 has been to wastefully destroy these assets. Why should any administration worry about wasting a hundred million dollars when they gleefully go hundreds of billions into debt each year? A responsible administration would see the folly of destroying these assets and would sell them as surplus, to add money to the public coffers and add smiles and value to millions of ciitzens. It is the policy that served the country well from the 1800s through the 1960s. American citizens might even regain a measure of faith in their government. 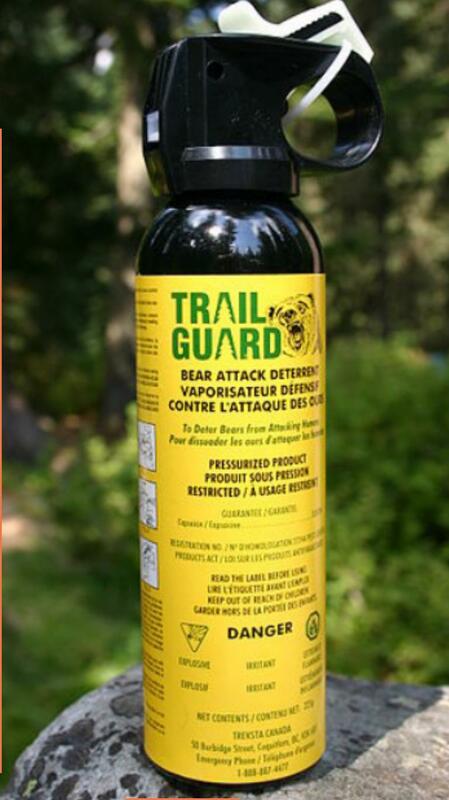 Almost all bear spray comes in containers that are too large to be transported with you on commercial aircraft. It is interesting to note that bear spray is more difficult to transport on commercial aircraft than firearms are. Both are prohibited from transport as carryons, unless you have special dispensation from the government. Then you can carry firearms, if you are an LEO with a letter authorizing it, a Sky Marshall, or a couple of other very special cases. I do not know if Sky Marshalls or federal agents may carry pepper spray in the cabins of commercial aircraft. But ordinary people can pack firearms in checked baggage. The limit on ammunition in checked baggage is 5 kilograms, or 11 pounds of properly packaged ammuniton. So, if you are on a hunting trip to Alaska or to Maine, you can bring rifles, pistols, and shotguns in your checked baggage. I have carried a couple of rifles, a shotgun, and a couple of pistols on some hunting trips. The 11 pounds of ammunition is usually enough. But bear spray is far harder to transport. A reminder about bear repellant: It’s best to buy it at your destination. Bear repellent is prohibited in the cabin of an aircraft. You can pack bear repellent in your checked bag if the volume is less than four ounces and if it has less than a two percent active ingredient of either CS or CN. Most bear repellents exceed these limitations. Three cans were discovered in carry-on bags this week at Anchorage (ANC), Bozeman (BZN) and Glacier Park (FCA). I did a couple of quick searches on the Internet for bear sprays, and the smallest that I found were 7.9 ounce containers. That is nearly twice the size that is allowed in checked baggage. There are plenty of smaller sizes of pepper spray available, and there may be a 4 ounce container available that I did not find. But the reason that they are not common is that anything less than about 8 ounces becomes problematic. Bears are known to shake off a single spray session, and come back for more. You do not want to be in a situation where a bear is coming back and your bear spray can is empty. This means that if you wish to use bear spray, it is best if you either drive to your hunt or understand that you will have to purchase the spray when you arrive and leave it there when you return. It is simply another thing to consider. Bear spray typically runs from 30 to 50 dollars for a canister, a bit more for the holster. One other option is to have the bear spray shipped to an address where you are going to hunt, and have it shipped back to your address when you return. Remember the limits: 11 pounds of ammunition per person, and a maximum of 4 ounces of bear spray per person. As many rifles, shotguns, and pistols as you are willing to pay for the extra bag charges. I bought five large cans of bear spray a few years ago during a family trip to the Tetons and Yellowstone. A man had been mauled to death on a trail near the Grand Canyon of the Yellowstone a week before we visited. Couldn’t bring the stuff home with us, so we dropped it off in a Bear Spray donation box in Jackson on the way to the airport. I think the drop off was either at an outdoor store or a ranger station. Some lucky visitor got ours for free in the next few days. TIP: If you are visiting bear country, try to find the free donation boxes where departing people drop their spray off. You might save some big bucks. The theory isn't new. Tom Smith, director of the General Social Survey, told me in 1997 that the large drop in gun ownership shown by his poll would “make it easier for politicians to do the right thing on guns.” According to Smith's survey, the percentage of homes with a gun has fallen fairly continuously since the 1970s — from approximately 50 percent to 32 percent earlier this year. But other surveys by Gallup and ABC News/Washington Post show that gun ownership rates have been flat since the 1970s. The number is uncertain for various reasons, including people's willingness to tell the truth to pollsters about whether they own guns. The “hard” data that we do know is that concealed handgun permits and gun sales have soared. Concealed handgun permits tripled from 2007 to 2015. The National Instant Criminal Background Check System shows that the number of gun purchases doubled from 2006 to 2014. While significant demographic changes have been occurring for decades, there hasn't been any steady increase in support for gun control. Indeed, the opposite is actually true. Look at Pew polls and you'll see that support for stricter gun control has fallen dramatically since the late 1990s. CNN's polls show a similar pattern since 1993. Back in June, I detailed a study by the Violence Policy Center that purported to show that private gun owners were far more likely to kill innocent people than to defend themselves. The study arrived at this conclusion by using woefully incomplete data sets from the FBI crime reports, which are voluntarily submitted (or not submitted) by law enforcement agencies. You can read my full analysis here, but the short version is that the VPC study interprets the lack of justified homicide submissions by law enforcement as proof that justified homicides do not occur, resulting in an unbelievable assertion that there were literally zero defensive gun uses in dozens of states over a five year period. The VPC study also fails to distinguish between legal and illegal firearm uses and fails to adequately consider defensive gun uses that didn’t result in anyone dying (i.e. the vast majority of such uses). This week the New York Times editorial board regurgitated that shoddy study, and managed to compound the illogic by drawing even broader and less supported conclusions than the original. The editorial is brief, yet still manages an impressive amount of specious reasoning. GUYMON, Okla. (AP) - The Oklahoma State Bureau of Investigation says a Texas County man shot and killed another man who allegedly chased the man home in his vehicle, then charged at him in his driveway. What’s incomplete is the analysis. First, suicides should be considered separately. Second, the study had to cover a period of seven years to get numbers that sounded scary enough. Third, given the millions of concealed carry permit holders in the country, we’d be surprised if the murder rate was higher than that of the general population. According to the FBI’s crime stats — which the VPC says it uses — nearly as many people were killed by hands and feet in one year as by concealed carriers over seven years. Fourth, would the VPC be satisfied if there were more deadly defensive gun uses? They don’t seem concerned with the number of incidents in which the mere presence or brandishing of a firearm is enough to deter the crime, or the number of times the good guys simply wounded the bad ones. Finally, how would the Times explain the 30% drop in all gun-related deaths over the last two decades coinciding with a huge increase in the number of people who concealed carry? The Times is correct that “concealed carry does not transform ordinary citizens into superheroes,” but that’s a false choice. Carrying a firearm does give ordinary citizens a fighting chance — unless they’re in a Times-approved “gun free zone.” More to the point, the Second Amendment is the “palladium of liberties” and isn’t rendered moot by crime statistics. 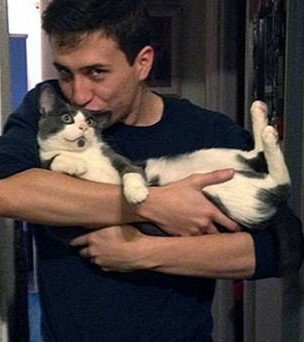 Steven Vouch reached for his gun when he realized he was being attacked, but it wasn't there. That is when his friend shot the bear with a .45. Vouch is on the left in the Cowboy hat. 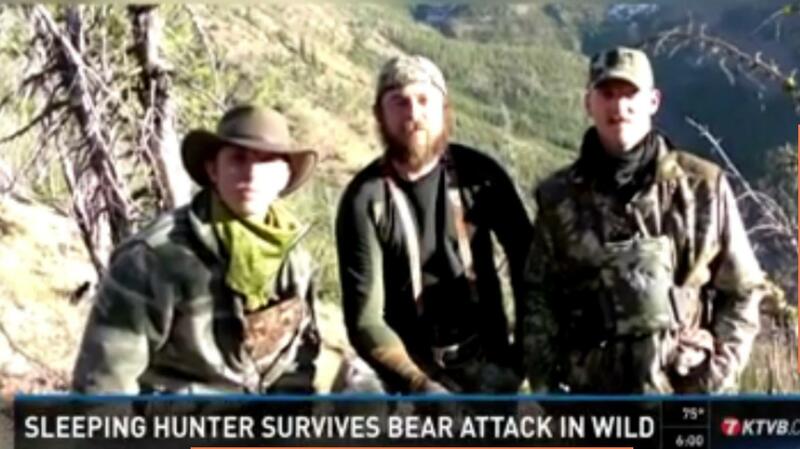 Vouch said the attack came after he and the other hunters had made camp for the night. He reported he awoke at about 1:30 a.m. to the feeling of something tugging on his hair and realized he was being bitten on the head by a bear. Vouch yelled, alerting the other people in the camp. One of the other hunters shot the black bear at close range with a .45 handgun, wounding it. The animal let go of Vouch and climbed up a tree, where Vouch shot and killed it, according to Fish and Game. "Give it up," Owens was told. And then the stranger's voice blurted, "Oh, [expletive], he has a gun, too." A pivotal hearing in the decadelong saga of the city of Delafield vs. the Hartland Sportsman's Club is scheduled for 1:30 p.m. Thursday in Waukesha County Circuit Court. Lawyers for the gun club are expected to ask Circuit Court Judge Maria Lazar to overturn a 2013 decision by the city to deny a conditional-use permit for the gun club. They are also seeking to have the city reinstate the permit that it revoked in 2010. The city's decision to revoke the permit came after a pregnant woman was grazed by a stray bullet that escaped from one of the club's firing ranges. The accident occurred the day after city officials had decided to begin an investigation into possible safety violations at the gun club. Three years later, the club applied for a new permit that was denied by the city. The homeowner saw two men approach his car in his driveway on the 4300 block of Decatur Avenue at about 3:20 a.m. Fort Worth Police Department spokeswoman Kathryn D. Rowell said the homeowner shot at them — hitting one — when they tried to enter the vehicle. WOODLAND — Acquitted of both first- and second-degree murder in the shooting death of her husband, Susan Hoskins has her first bid at freedom in more than a year while prosecutors decide whether to retry her on a lesser charge. Hoskins was freed from the Yolo County Jail on $140,000 bail as of this morning. On Monday, Yolo Superior Court Judge David Reed declared a mistrial in her homicide case, the result of jurors saying they were hopelessly deadlocked on a count of voluntary manslaughter. In this story, a man used a rifle in self defense. The article says that it was an "automatic" rifle, but it was almost certainly a semi-automatic. Legal automatic rifles are exceedingly rare. Another interesting point is that the factory that makes Hi-Point carbines is in Mansfield, so it would be interesting to learn if the rifle was a Hi-Point. 200 block of South Diamond Street, Mansfield - A man told police Sunday night that after someone knocked at the door , a person inside the residence opened the door and he heard a gunshot. He then ran upstairs to get his automatic rifle and began shooting through the floor at the unknown suspects below, in self defense. When he came back downstairs, everyone was gone. According to witnesses at the scene, a man entered the store, waved a gun around and announced a robbery was to take place. They said a security guard then emerged from the back of the store and a struggle ensued. Witnesses said the struggle spilled to outside of the store and that when the would-be robber pulled a gun on the security guard, the guard shot and killed the man. After more than two days of deliberations, a Putnam County grand jury has declined to prosecute a man for killing a father of two during an argument just over a month ago. The Putnam County Sheriff’s Office said James Cuneo admitted to shooting the 29-year-old Keith Gravitz during an argument on Sept. 5. CORYELL COUNTY -- The Coryell County Grand Jury has declined to take action against Gatesville attorney Joe Rodriguez in the February 2015 shooting death of Gus Peter Grammas, finding that the shooting was justified. The homeowner told police Jackson tried to attack him, and that he shot Jackson in the stomach, arm and leg in the fight. Police say Jackson's injuries are not life threatening, and that he will be charged with burglary once released from the hospital. The juvenile states that he returned home from church surprising an intruder and a struggle ensued, during the struggle the victim was able to retrieve his father's gun and was shot with it. Florida Sheriff Supports Open Carry; Criticizes so called "secret vote"
The secret ballot is a voting method in which a voter's choices in an election or a referendum are anonymous, forestalling attempts to influence the voter by intimidation and potential vote buying. But the Sheriffs' Association vote on the open carry bill was anything but secret, except in the most perverted sense of the term. The vote was carried out by telephone, so the management of the Sheriffs' Association had every opportunity to "buy" and influence votes. The Sheriffs' votes were not anonymous to the management. The only thing "secret" about the ballot is that the Sheriffs were assured that their votes would not be made public, so that they could not be held accountable by the voters! Pinellas County Sheriff Bob Gualtieri, who is also the legislative committee chair of the FSA, said because of the timing with which the proposal is projected to come up in the legislative session, sheriffs were encouraged to call in and vote by phone and the results would be presented as the group opinion. Other than the tallies being taken by phone, the vote was typical of other decisions the FSA has conducted, he said. You’ll remember Sheriff Gualtieri. He’s not known for his support of guns, gun owners or pro-gun legislation. In May of 2013, he vowed to start enforcing a little-used county ordinance that requires background checks at local gun shows for all private sales. The county ordinance gathered dust since it was enacted in 1998. Violators faced misdemeanor charges. After garnering a few headlines, the plan fizzled. Gun shows were held without any problems. No arrests were ever made. McKeithen said he was one who is in favor of the concept of open carry and that issues with the bill’s language could be dealt with over time. He said as an officer sworn to uphold the Constitution, open carry came down to supporting the Second Amendment. There is no logical or evidence based reason to ban the open carry of firearms. The practice is already law in the vast majority of states. Texas is the most recent addition to those who do not ban open carry, making the total 45 states. 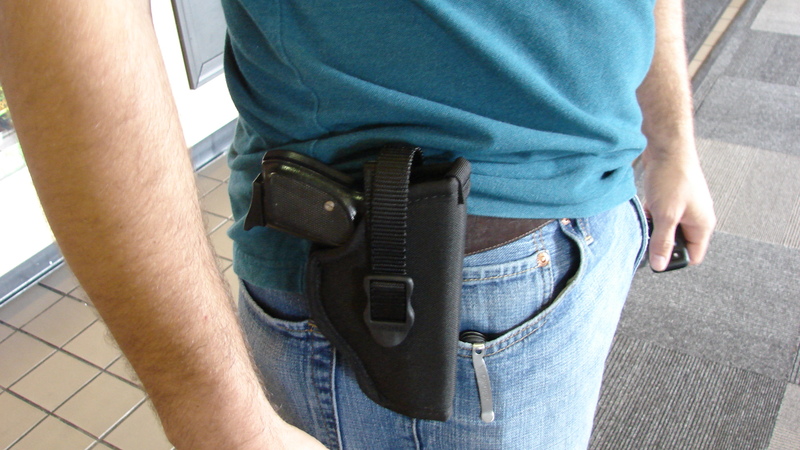 The Florida law is more restrictive than most, only allowing those with a concealed carry permit to carry openly. There are a few "may issue" states that are highly restrictive of permits to carry either openly or concealed; states such as New Jersey, Maryland, and Hawaii. Gwinnett Police said Tuesday morning Brian E. Davis, 48, died from multiple gunshot wounds after the incident around 6:30 p.m. Saturday, Oct. 24, at 369 Freeport Drive in unincorporated Lawrenceville. Police believe the shooter, Jerry Hayes, 46, of Loganville, acted in self-defense. The woman, a resident of the complex, told police her son forced his way into her apartment, “... and she was defending herself and other family members from an assault being committed by her son,” police said in a statement. Farmington Hills Police Chief Charles Nebus said the mother called 911 after the incident and has claimed self-defense. This substitute amendment eliminates the prohibition against possessing, purchasing, or selling a switchblade knife. This substitute amendment treats knives in the same manner as current law treats firearms by prohibiting local governments from regulating the sale, purchase, or possession of knives and prohibiting charging a person with disorderly conduct for going armed with a knife without criminal intent. Finally, this substitute amendment eliminates a knife from being considered a weapon for purposes of a license to carry a concealed weapon, and eliminates the general prohibition against going armed with a concealed knife except that, under the substitute amendment, a person who is prohibited under state from possessing a firearm may not go armed with a concealed knife that is a dangerous weapon. The last clause reduces the classes of persons who are prohibited from carrying concealed knifes that are "dangerous weapons" to those who are prohibited by law from possessing firearms. The phrase "dangrous weapon" has always been ambiguous, and has been used to cover a wide variety of instruments in Wisconsin courts. An amendment was added to AB 142 that retains political subdivisions' ability to "[prohibit] the possession of a knife in a building, or part of a building, that is owned, occupied, or controlled by the political subdivision." The amendment was not showing on the Wisconsin legislative site as of the time of publication. 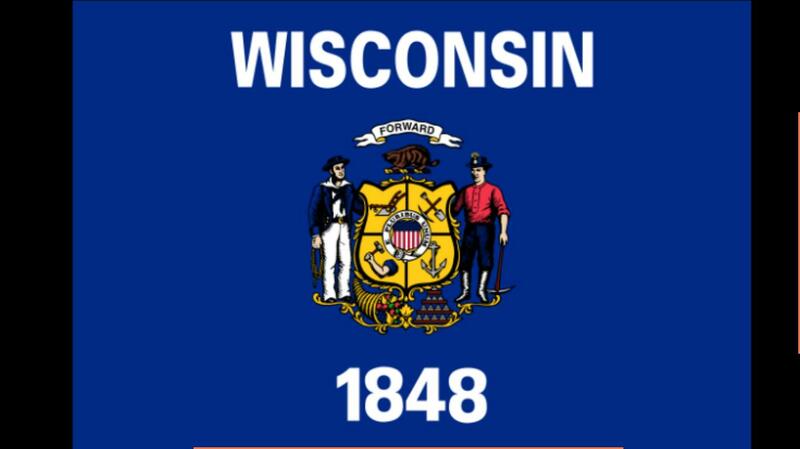 Wisconsin has had a patchwork of local ordinances restricting knives as well as state law prohibiting the carry of concealed weapons without a permit. That law has been interpreted to include many ordinary knives by various judges, particularly in the urban centers of Milwaukee and Racine. Wisconsin also has an antiquated ban on switchblade knives passed at the height of switchblade hysteria. AB 124 would make the knife laws of Wisconsin uniform throughout the State. It remains to be seen if the carveout for government buildings will pass the Senate. AB 142 passed the Assembly with strong bi-partisan support. Democrat support for knife reform legislation increased significantly after the death of Freddy Gray after the arrest for possession of an ordinary pocket knife in Baltimore this year. It is hard to see how any fair reading of the amendment could allow for a law that prevents people from carrying knives, which have been arms used for security, defense, hunting, recreation and other lawful purposes as long as there have been people. Representative Kathleen Bernier (R- Chippawa Falls) was the primary sponsor of the bill in the Assembly. Three cases are going before the Missouri Supreme Court today, 27 October, 2015, to determine if the Court will uphold Amendment 5, which was passed by an overwhelming majority of the people last year. The cases seem quite clear. They are prosecutions of people who have non-violent felony convictions. Lower courts have ruled that Amendment 5 meant what it said in its clear language. "Section 23. That the right of every citizen to keep and bear arms, ammunition, and accessories typical to the normal function of such arms, in defense of his home, person, family and property, or when lawfully summoned in aid of the civil power, shall not be questioned. The rights guaranteed by this section shall be unalienable. Any restriction on these rights shall be subject to strict scrutiny and the state of Missouri shall be obligated to uphold these rights and shall under no circumstances decline to protect against their infringement. Nothing in this section shall be construed to prevent the general assembly from enacting general laws which limit the rights of convicted violent felons or those adjudicated by a court to be a danger to self or others as result of a mental disorder or mental infirmity. The City's arguments are essentially: Guns are bad. More guns result in more bad things. People who commit felonies are more likely to commit more felonies. Therefore keeping them from having guns is a good thing. The Supreme Court can do this because, well, because no one can stop you. Link to City brief (pdf) here. The State's arguments are these: The Amendment means what it says. It differentiates between violent and non-violent felonies. The current law covers all felonies, therefore it is not tailored to the Constitutional requirements, and should be struck down. The Court has the authority and the duty to uphold the will of the people as expressed in the amendment. Link to State brief (pdf) here. The ACLU of Missouri has come out on the side of upholding Amendment 5. The federal constitution provides the floor, not the ceiling, for the liberty that is guaranteed to citizens against state governments. 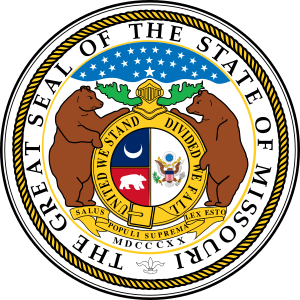 Even prior to the adoption of the Fourteenth Amendment—that is, before the Bill of Rights was incorporated to the States—the framers of Missouri’s Constitution and the voters of this State chose to enact a constitutional provision insuring an individual’s right to keep and bear arms. Missouri has never mirrored the language of the Second Amendment. Missouri ACLU brief (pdf) at this link. At the core of the "violent felon" wording of Amendment 5 is the proliferation of felonies in the United States. It has resulted in this backlash. Nearly everyone in the country commits multiple felonies, whether they want to or not. There are simply far too many laws on the books. Amendment 5 attempts, in part, to restrain the liberties that are lost as the result of this proliferation of felonies. Little is quite as corrosive of the rule of law and faith in the legitimacy of the government as a Court claiming that an amendment to the Consitution, duly passed by the electorate, is invalid. It strikes to the heart of the idea of the consent of the governed, one of the key principles the United States is founded on. That the consent of the governed is under assault is not too surprising; one of the core beliefs of "elitists" faith is that it is up to the elite to "manufacture" such consent. In the "elitists" view of reality, the elite decide what the electorate should vote for, then the electorate is supposed to vote for it. If it does not, it is up to the elite to "correct" the "error". The Second Amendment is one of the "errors" that the current governing elite wants to "correct". It remains to be seen if the Missouri Supreme Court will bow to the will of the people, or to the self framed "elite". In the Eastern California town of Clovis, California, at the foot of the Sierra Nevada mountains, Marilyn Williams, a woman who earned a sharpshooter medal in high school ROTC, scared a couple of burglars so badly that they dropped their loot and ran. She did it with a Marauder air rifle. The Marauder is one of the more powerful popular air rifles. With .25 caliber pellets, the pre-charged pneumatic can reach energy levels (45 foot-pounds) about two thirds of a .22 short cartridge , one of the lowest powered firearm cartridges. The Marauder has multi-shot capacity. It sports a 10 shot magazine in .177 and .22 calibers, and 8 shots in the .25 caliber. The short bolt stroke allows for rapid fire. In practised hands, the air rifle is capable of inflicting serious injury or death on a human target. 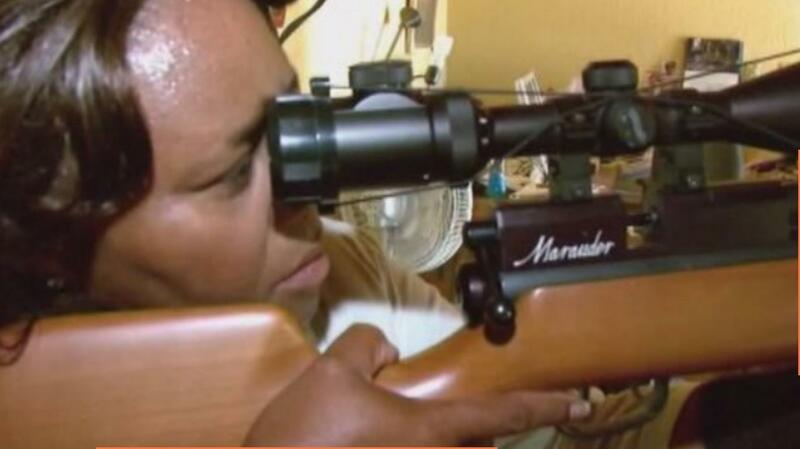 She got out her gun and had them in her scope; however, she decided not to fire. According to police, the two burglars ran off. Police tried to find them but the pair disappeared and are still at large. The burglars dropped the loot from the previous burglary of an elderly couple, their own weapon, and a mask. In the Marauder forum at marauderairrifle.com, they seem to believe the rifle used is the largest caliber Marauder, a .25. The bore of the rifle shown in the pictures makes it seem possible, but it could be a .177 or a .22. If your curious if the Hand-pump is worth it or if you should just get an air tank... I'm 155 lbs of nothing special and I can handle the pump just fine. Yes, it takes longer to fill the gun but it also saves you a lot of money in the long run. I bought my first pcp last week, a .22 marauder and I chose the hand pump route. I also weight 140 (5'8"). From my research, I wasn't sure if I can pump this thing because some people had mentioned that it was very difficult. When I first got it, I pumped it very slowly. It was very easy up until 2000 psi. Then, it was very, very difficult. I kept looking at the pressure gauge to check my progress and it was so tiring! But, I found that my pumping technique was bad. I was moving the pump handle slowly, but the trick is, when pumping down, it should be one quick, fluid motion. When the handle is extended all the way up, I put all my weight into it, using my arms and kind of jump into it. I can bring the handle all the way down very easily like this. Also, you need to pause at the top and bottom of each stroke. Once I figured this out, it is very easy to pump to 3000 psi. When I first figured it out, I accidentally, pumped a tad over 3000 because it was so much easier. Other options for recharging the Marauder are Scuba tanks an high pressure compressors. One of the reasons for the success of the Marauder is the .22 ammunition bubble. With .22 ammunition difficult to come by, air rifles provide an alternative. The Marauder is very capable for small game hunting, offers multiple shots, and the ammunition is available. It is also suppressed and very, very quite. Another reason is that air rifles do not have the insane amount of legal restrictions that have been imposed on firearms. Air rifles can be ordered through the mail, just like anti-tank rifles could be in the United States before 1968. Air rifles purchasers do not have to go through the ineffective and intrusive background checks, or worry about groups of gun confiscators coming to their house, as has been happening in California. With the success of the Marauder, it is likely that competition will increase and the price will decrease. The Marauder started priced far lower than the existing competition of similar air rifles. Benjamin has already come out with a synthetic stock model at a reduced price. The Marauder is made in the U.S.A.
Marilyn Williams' use of the Marauder to defend against burglars can only add to the air rifle's popularity. The Eastside restaurant owned by Bouvier was robbed Saturday night, the first time that's happened in the popular Cajun eatery's eight years of business. Now, Bouvier is offering a 25 percent discount to customers who can show a concealed carry permit. "I don't want Papa Roux to turn into the O.K. Corral," Bouvier told The Indianapolis Star by phone Sunday morning, "but I don't want to be an easy target." Bouvier announced the discount offer on his Facebook page Saturday night, shortly after learning of the robbery. "If thugs are going to come in and threaten OUR extended family with guns, you'd better believe I will use every trick I know to protect (our family)," he wrote. The message drew more than 1,000 likes by 1 p.m. Sunday. "A few loyal customers have said they’ll be avoiding Papa Roux because of my stance, and that's a little disheartening. But it's minuscule compared to the overwhelming support," he said. "It’s a shame that some people feel they need to stay away. They’ll go out to eat with the possibility that a criminal will bring a gun in, but they’ll stay away if they think customers might be carrying. That’s weird to me. As with the size of portions, cleanliness, staff attitudes, prices, and taste, restaurants gain a reputation for being easy robbery targets or places to avoid. Papa Roux had never been robbed before Saturday, the 25th of October, 2015. The restaurant has been in business for eight years. Owner Art Bouvier is taking reasonable steps to see that it does not happen again. Robberies are bad for business; but Papa Roux has made a smart move to turn this lemon into lemonade. Not only are they likely to gain an number of loyal, well heeled customers, but it is hard to buy this level of media attention. At noon Monday, there was a steady stream of customers heading to Papa Roux, many with a license to carry that would earn them a 25-percent discount. There's a sign on the door asking customers for patience as Papa Roux deals with a tremendous amount of media coverage since the story broke on Saturday. "The word needs to get out,” said owner Art Bouvier, speaking about those people in line with a license to carry a handgun. “It seems like the world is coming to a place where a lot of people are taking advantage of goodhearted people and just coming in and taking and taking, and maybe it's time we stood up to that,” said Tina Miller of Indianapolis. Disarmist organization, Moms Demand Action, funded by NYC former Mayor Michael Bloomberg, tried to push opinion in the opposite direction. Shannon Watts, a corporate public relations executive who heads the organization, lamented the restaurant policy on a local TV show. IN: Misplace Gun? Use Sword! She reached for her gun in a nearby drawer, but she accidentally opened the wrong drawer during the chaos of the moment, so her gun wasn’t there. Police said early Sunday morning Randy Thomas, 24, and another suspect entered a bar in the 4800 block of Erdman Avenue armed with guns. The pair robbed several bar patrons at gunpoint, according to police. A local pizza delivery driver fought off an armed gunman during a delivery Saturday night on Jacksonville's Westside. The driver was delivering food to a neighborhood behind Westchase Apartments when he was approached by two armed men, according to police. One suspect demanded the driver's money, but the driver was armed and shot one of the two men. Golden police officers arrived and learned that the off-duty officer, who was armed with a handgun, approached the motorcyclist on foot and identified himself with his badge. There was a short struggle and a single shot was fired into the front end of the motorcycle. The motorcyclist was not hit, but did have minor injuries to his hand from flying debris. The name of the off-duty police officer and his agency is not being released at this time. Exact details about the road rage incident have not been released. Chicago Juries Using Jury Nullification for Gun Cases? Is jury nullification being used in Chicago gun cases? In strict parlance, jury nullification refers to the right of jurors to judge both the facts and the law. If a juror believes that justice will not be served by following the law, they always have the right to vote not guilty. It has always been the right of American jurors to do so, but about 1900, judges stopped telling jurors that they had that right, and gradually that decision morphed into an assumption by judges that it was wrong for jurors to assert their rights. In spite of the antipathy of the court system to juror's rights to nullify bad law, they still have the right to do so. But even though they’re winning seven of every 10 gun cases, Cook County prosecutors acknowledge they’re having a tougher time getting convictions. In part, that’s because of the public’s concern over police tactics in the wake of high-profile shootings of African-Americans by police officers around the country, according to both prosecutors and defense attorneys. They say that’s caused growing skepticism among jurors about the credibility of police officers. Strictly speaking, that is not jury nullification. That is just jurors being diligent at their job. If the police account seems unreasonable, jurors should be cautious about convicting. Numbers from the article are interesting. The article says that police collected about 7,000 illegal guns in 2014, and about 5,500 in the first nine months of 2015. In 2013, Chicago seized 6,800 guns. That is a total of 19,300 guns for 2013, 2014 and the first nine months of 20 15. In the same period, there were 5,700 illegal gun possession cases decided in the Cook County court system in the same period, about 3.4 guns per case. I suspect that quite a few of the guns collected do not come from criminal activity, but simply from someone inheriting a gun that they have no interest in, and which they have difficulty legally disposing of. There are no gun stores in Chicago proper, so a person unfamiliar with guns could be uncertain about how to dispose of a firearm. Turning it in to police might seem the safest option. 4,100 of the 5,700 cases ended in convictions, the vast majority from plea bargains. In the other 1,600 cases, the defendants were not convicted. In about 600 cases, the prosecutor dropped the charges. It is not clear how many of the remaining 1,000 cases were cleared by a judge, and how many ended in jury trials. As part of the passage of the shall issue law in Illinois in 2013, Chicago dropped its requirement for registration of handguns in the City. People still must have a Firearms Owners Identification Card to merely possess, let alone carry, a firearm. We are not seeing a wholesale application of jury nullification in Chicago, but skeptical jurors are making sure that the police follow the rules more carefully. State police say a Henderson County man shot someone who was breaking into his home Friday night. NOTTOWAY COUNTY, Va. -- Police identified the woman shot and killed inside a Nottoway home Wednesday morning as 35-year-old Lakisha S. Knight of Crewe. Virginia State Police said Knight was shot and killed after she broke into a home on East Courthouse Road. Belize: Alleged pawnshop robber shot dead! Reports to Amandala are that Barrera and another man had gone to rob the pawnshop, and Barrera was shot, multiple times inside the shop. There is no word about his accomplice, who apparently escaped. Just before Barrera’s body was removed from the scene, police were seen taking two crime scene markers off two bicycles that were parked in front of the pawnshop. Kephawn’s Pawnshop is owned by a son of PUP Port Loyola standard bearer Gilroy Usher, Sr. The man woke up to find the suspect sitting on him and holding a knife. He pushed the suspect off him and grabbed a handgun and told him to stop. The suspect put on his pants and fled the house. The victim fired three times toward the suspect trying to convince him to stop. Unhurt, the suspect continued running, breaking into a house in the 2700 block of Pettygrove Street, where police took him into custody. In a Q&A style interview published Wednesday on the Palm Beach Post’s opinion blog, Pinellas County Sheriff Bob Gualtieri, who chair’s the Florida Sheriff’s Association’s legislative committee, spelled out his opposition to SB 300, the “Open Carry” bill, which is moving forward in the legislature. I interviewed him for this story, and we spoke about his comments in the Post’s Q&A interview. The sheriff bristled somewhat when I asked if he was a Second Amendment supporter. NEW LEXINGTON — A 23-year-old Glouster man accused in the death of a Corning resident has been cleared of charges of murder and felonious assault. Brandon Keith was first charged in July in the death of 55-year-old Fred Fisher. The Perry County Prosecutor’s Office presented the case to a grand jury Monday which included an additional murder charge. After hearing the case, the grand jury decided not to return an indictment, exonerating Keith. The video appeared to show that Fisher threw the first punch before Keith retaliated, striking Fisher who then fell to the pavement and suffered a serious head injury. An employee who witnessed the altercation called 911. Fisher was transported to a hospital in Columbus where he died three days later from his injuries. The Franklin County coroner identified the cause of death as blunt force head trauma. Keith was taken into custody the morning after the fight but had been free on bond since his preliminary hearing in July. In reaction to school shootings like the one in Roseburg, Oregon earlier this month, some have called for reexamining “gun-free zones” on campus. But one K-12 school outside of Boise, Idaho has taken a different tack, arming itself and training some staff members how to use a gun. Garden Valley School District, a rural district with just 200 students, voted earlier this year to purchase four rifles and 2,000 rounds of ammunition for self-defense. Here & Now’s Robin Young speaks with Greg Alexander, the district’s principal and superintendent, as they enter their first school year under the new policy. A new bill aimed at loosening restrictions on firearm suppressors is making its way through Congress in an effort to slightly expand the scope and strength of the 2nd Amendment. The Hearing Protection Act of 2015, sponsored by Rep. Matt Salmon R-Ariz., would eradicate a $200 tax stamp for suppressors. The legislation would also remove the suppressors from restraints set forth by National Firearms Act. 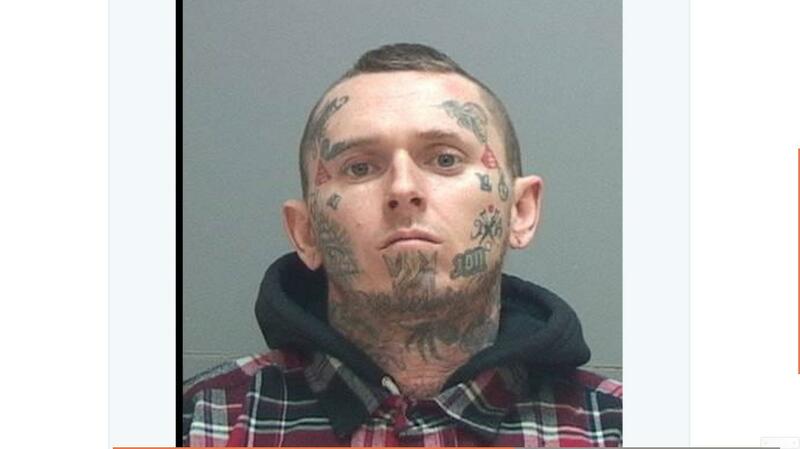 McCaslin's girlfriend, Erica Satterly, told police her boyfriend chased Kuhn as he fled outside for help. The boyfriend then ran to the backyard, where Kuhn's 10-year-old daughter stood. Fearing for her life, Lambertus said, Kuhn fired at McCaslin. Jefferson Circuit Court Judge Judith McDonald-Burkman dismissed one count of murder and three counts of first-degree wanton endangerment. Kuhn still faces a charge of receiving a stolen firearm. Most of my carry is with a beat up Glock 17 and/or the no longer manufactured S&W 337. The 337 has a 3.2 inch barrel on the Scandium frame with the titanium cylinder. Loaded, the Glock weighs a smidgen under two pounds (31.8 ounces); the 337, just under 1 pound (15.4 ounces), according to my digital scale. The ballistics of 9mm+P delivers a 115 grain .355 inch projectile at about 1350 fps; the .38+P, a 125 grain .357 inch projectile at about 950 fps. The revolver has high viz adjustible sights and Crimson Trace grips. The Glock has TruGlo TFO combination light gathering and tritium sights. Implicit to the "Why?" question are two answers. Quite a while ago, a well known gun writer described the optimum every day carry (EDC) handgun. Paraphrased, it had the capacity of Maxim machine gun, the knockdown power of a .45-70, the recoil of at .22 short Olympic pistol, the size and weight of a lipstick, the ergonomics of a Colt Woodsman, is absolutely reliable, and has the accuracy of a sniper rifle. In short, an EDC is, by necessity, a compromise of a number of desirable characteristics. In my opinion, the Glock comes closest to optimizing those desirable characteristics with excellent capacity and power in a lightweight, easily carried and easily shot frame. While not a target pistol, it has good "combat" accuracy and legendary reliability. The 337 is a compromise aimed for more discreet and backup carry. It is only half the weight of the Glock, almost as powerful, and is a little easier to conceal. It slips into a pocket fairly easily. The laser adds night sight capability and a bit of visual deterrence. Given the current paucity of .22 ammunition, it is hard to imagine two ammunition calibers easier to come by than 9mm and .38 special. The second "why" is more important. The primary reason that I carry is for political purposes. As a member of the gun culture, of mature age and independent means, the chances of needing an EDC for defense of self and others are fairly low. The chances of needing to defend the Constitution from clear and present political dangers are everyday and common. Carrying a firearm confirms the right of citizens to use force. It confirms that the ultimate sovereign is the individual citizen, not the State. It confirms that the federal and state constitutions mean something; are not infinitely malleable by the courts, and that government is limited by the rule of law. Openly carried weapons visually and boldly declare that the Second Amendment is not merely faded ink on dusty parchment, and that the right to self defense is known and cherished. It is the equivalent of the rattle on the rattlesnake or the May Day military parade. It warns our enemies, foreign and domestic, "You do not want a piece of this!" That, fellow people of the gun, members of the gun culture, is what and why I carry. You can’t argue with someone who is lying about his position or whose position is not based upon reason. You can talk all day about how crime has diminished where concealed carry is allowed, while it flourishes in Democrat blue cities where gun control is tightest. You can point to statistics showing that law-abiding citizens who carry legally are exponentially less likely to commit gun crimes than other people. You can cite examples of armed citizens protecting themselves and their communities with guns. You can offer government statistics showing how the typical American is at many times greater risk of death from an automobile crash, a fall, or poisoning than from murder by gun. But none of that matters, because this debate is not about facts. It’s about power. The liberal anti-gun narrative is not aimed at creating the best public policy but at disarming citizens the liberal elite looks down upon – and for whom weapons represent their last-ditch ability to respond to liberal overreach. So they argue in bad faith, shamelessly lying, libeling their opponents, and hiding their real endgame. Sure, sometimes the mask slips and a liberal politician like Mike Bloomberg or Diane Feinstein reveals their true agenda, but mostly they stay on-message. For example, Barack Obama, who always tries to reassure us bitter clingers that he doesn’t want to take our guns, speaks longingly about the Australian plan – which was confiscation of most viable defensive weapons from the civilian population. Obama is lying – about gay marriage, about your doctor – and he is likewise lying about guns. The minute he could disarm every American civilian he would, something particularly alarming in light of his pal Bill Ayers’ infamous observation that ‘fundamentally transforming’ America would require killing at least 25 million citizens. No wonder free Americans are done pretending the gun argument is a rational debate and are responding with an extended middle finger – and the challenge to come and take their arms. The fact remains that any outright attempt to take the arms from tens of millions of American gun owners would almost certainly result in a second Civil War. And we all know how the first Civil War went for the Democrats. So, through a campaign of shaming, dissembling, and outright slander, liberals are trying to talk Americans into giving up their weapons voluntarily. There’s always another “common sense” restriction to enact, spurred on by a tragedy that the last “common sense” restriction didn’t prevent and that the proposed new “common sense” restriction would not have prevented. They want to do it in baby steps, and with our cooperation, since they cannot do it by force. There are a few people arguing in good faith, but it’s too late. Liberal writer Kurt Eichenwald recently wrote a “compromise” proposal to settle the gun issue that was notable because he actually analyzed gun freedom arguments and agreed with some of them. He cited the silliness of the “assault weapons” and “cop killer” bullet lies. While he still rejects 30 round capacity magazines, he began with opposition to silencers and then, after hearing facts and evidence from knowledgeable gun owners, changed his position. That’s good faith, the threshold requirement for a real debate, but Eichenwald mistakenly assumes this is a debate based upon reason between good faith opponents. It’s not. It’s based upon the desire of liberals for total supremacy. TX: Burglary Suspect Fired on, Chased, and Caught! The suspect had broken a window and was gaining entry when the victim fired a gun at the suspect. Enroute to the call, officers learned that the victim was now chasing the suspect on foot. When the first officer arrived on scene, the victim had the suspect detained in the 2200 block of 26th Street. When the suspect saw the officer, he ran and the officer pursued on foot. The suspect was tackled by a quick thinking citizen who held on until officers arrived. The suspect was arrested and transported to the Lubbock County Detention Facility and booked in. The Secretary of State in Maine has approved the following petition for the elimination of private sales of firearms in the State. There are a few exceptions, but essentially, all sales of firearms would be required to be approved by the federal government before such a sale would be legal. It would make the exercise of Second Amendment rights subject to prior restraint by the federal government. It would require that records be kept of the firearm, the purchaser, and that such records would eventually be turned over to the federal government. This is the elimination of private sales, because once the transaction is required to be pre-approved by the government and records kept, the sale is no longer private but is permanently recorded by the government. The pdf file of the petition can be accessed at this link. I have copied the petition from pdf format so that it can be easily accessed and read. A. "Corrections officer" has the same meaning as in section 2801-A, subsection 2. B. "Family member" means husband, wife, domestic partner, parent by blood, parent by adoption, child by blood, child by adoption, sibling by blood, sibling by adoption, grandparent, grandchild, niece, nephew, aunt, uncle, first cousin, father-in-law, mother-in-law, son-in-law, daughter-in-law, brother-in-law, sister in-law, stepfather, stepmother, stepson, stepdaughter, stepbrother, stepsister, half brother, half sister or intimate partner. C. "Firearm" has the same meaning as in Title 17-A, section 2, subsection 12-A. D. "Firearm dealer" means a person who holds any federal firearms license under 18 United States Code, Section 923(a) (2015). E. "Intimate partners" means individuals in a dating relationship who are currently living with each other. F. "Law enforcement agency" has the same meaning as in section 3701, subsection 1. G. "Law enforcement officer" has the same meaning as in section 3701, subsection 3. H. "Person" means an individual, corporation, partnership, firm, trust, organization or other legal entity. I. "Sell" has the same meaning as in Title 17-A, section 554-A, subsection 1, paragraph C.
J. "Transfer" has the same meaning as in Title 17-A, section 554-A, subsection 1, paragraph A.
K. "Transferee" means a person who receives or intends to receive a firearm in a sale or transfer. L. "Transferor" means a person who delivers or intends to deliver a firearm in a sale or transfer. M. "Unlicensed person" means any person who is not a firearm dealer under this section. 2. Background checks required for all sales and transfers. Except as provided in subsection 8, each sale or transfer of a firearm occurring in whole or in part in this State between unlicensed persons must be preceded by a background check on the transferee and an unlicensed person may not sell or transfer a firearm and an unlicensed person may not receive a firearm without complying with the process described in this section. 3. Background check conducted by firearm dealer. When both parties to a prospective sale or transfer of a firearm are unlicensed persons, the transferor and transferee shall meet jointly at a firearm dealer and request that the firearm dealer facilitate the sale or transfer. A firearm dealer who agrees to facilitate a sale or transfer under this section shall process the sale or transfer as though selling or transferring the firearm from its own inventory to the transferee, complying with all requirements of federal and state law that would apply if it were making such a sale or transfer, including all background check and record-keeping requirements. 4. No sale or transfer if failed background check. Neither a firearm dealer nor a transferor may deliver any firearm to a transferee if the results of the background check pursuant to subsection 3 indicate that the transferee is disqualified to possess firearms under state or federal law. B. This section does not prevent the transferor from removing the firearm from the premises of the firearm dealer if the results of the background check pursuant to subsection 3 indicate that the transferee is disqualified to possess firearms under state or federal law. pursuant to this section may charge a reasonable fee for services rendered. 7. Completion of forms. A transferor and a transferee must each complete, sign and submit all federal and state forms necessary to process the background check and otherwise complete the sale or transfer pursuant to this section. G. The transfer occurs by operation of law upon the death of a person for whom the transferee is an executor, administrator, trustee or personal representative of an estate or a trust created in a will. B. For a 2nd or subsequent conviction involving the sale or transfer of one or more firearms, a Class C crime. between individuals not licensed as firearm dealers. If neither party to a sale or transfer has a federal firearms license, the parties meet at a licensed firearm dealer, who conducts a background check on the transferee and completes the sale or transfer as though selling or transferring from the dealer's own inventory. Exceptions to the background check requirement are made for transfers between family members, while the parties are hunting or sport shooting, for emergency self-defense, in the presence of the transferor and in other circumstances.